Having focused for the last eight plus months on my latest novel release, Without the Veil Between, Anne Bronte: A Fine and Subtle Spirit, I have neglected promoting my previous two novel publications, A House Near Luccoli and its Sequel To A Strange Somewhere Fled. 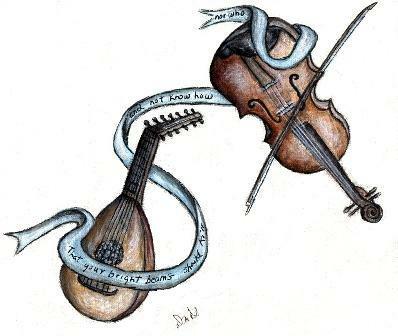 Three lutes huddled against the emptiness of a corner, stepsisters born separately of rosewood, maple, and ebony, sharing an inheritance of long necks, heads back, full bodies with rosettes like intricately set jewels on their breasts. Theirs was harmonious rivalry, recalling a master’s touch and understanding. On the settee a leather case contained a violin resembling a dead man on the red velvet of his coffin, not mourned but celebrated by nymphs dancing through vines on the frieze high around the room. He was the epitome of the paradox of true genius, in ‘one breath’ making masterpieces and, in another, messes. By the second decade of the 18th Century Stradella’s compositions were rarely performed, eclipsed by cloak-and-dagger operas and novels that portrayed him more as a libertine than serious composer. Of course, a little truth can spark and fuel lies. Whether acting on a patron’s whim or his own impulse, uncertainty and risk were inevitable for Stradella. It was his nature to embrace them. My intention was foremost, through specifics and speculation, to present Stradella as an enticingly fascinating if flawed human being and, without reservation, a gifted composer. I focused on Stradella’s last year in Genoa (1681-1682), structuring my narrative with a succession of actual events, mainly musical, and initiating the fictional Donatella’s association with him through his need for a new residence and copyist. By 1681 Stradella’s professional and personal life have begun to unravel again, losing him a prime position at Genoa’s la Teatro Falcone and residence on the city’s street of palaces, la Strada Nuova. Stradella is offered a respectable if slightly shabby apartment in a house near la via Luccoli and yet another chance to redeem his character and career. He moves in with a flourish met with curiosity and consternation by the caretakers who are also tenants, three women, including Donatella, who, like the city she lives in, hides her longings, propriety the rule not cure for what ails her. Even before I had completed A House Near Luccoli, I sensed I might carry Stradella’s inimitable spirit and music forward into a sequel. That plan was encouraged by Henry Purcell’s reported reaction to Stradella’s untimely death. To A Strange Somewhere Fled also drew from my very personal experience of living in the Oxfordshire village of Wroxton and Wroxton Abbey, an away-from-London refuge for Francis North and his brother Roger North, both amateur musicians and important figures in the court of Charles II. I first heard about Hildegard of Bingen (c.1098-1178) in a history of music class in college. Her chants are sublime and, as I fell in love with them, I started to read more about their composer – the first woman in the Western world to do so. It turns out Hildegard did much more than that – she was a pioneer in many fields thus far reserved as a man’s domain. One such field was medicine. She was a skilled herbalist who applied treatments in a way most medieval physicians did not, namely by observing the outcomes of the cures rather than relying on ancient texts for guidance, irrespective of whether they worked or not. As I researched Hildegard’s life, two things began to puzzle me in the (admittedly sparse) historical accounts. One is that she was enclosed at a young age (possibly as young as eight or ten) at a very strict women’s convent, where the residents lived in enforced poverty and isolation from the world. In such a place, historians tell us, she lived for the next three decades. This, to me, is hard to believe. The psychological and intellectual toll such privations would exact on a child would be extremely damaging. Yet Hildegard re-emerges in contemporary chronicles, around the age of forty, as an accomplished physician, writer, and composer, and a diligent student of nature. She is already well-known in the Rhineland, and her theological writings are about to catch the attention of Pope Eugenius III. She is also preparing to leave the abbey of St. Disibod, where she had been enclosed, and start her own foundation. Clearly, something happened during those decades that allowed her curiosity to be fostered, her intellect to develop, and her creativity to flourish. There is no reliable record of her early life beyond the few basic facts of her provenance and enclosure, and that is what inspired me to imagine what that life may have been like. The Greenest Branch is a fictionalized account of the early life of Hildegard of Bingen, but it is rooted in what we know about her and the world she inhabited. It is a world, needless to say, that is not conducive to female empowerment. That she managed to accomplish so much is a testament to her fierce intelligence, strength, and determination. The second book in the series, titled The Column of Burning Spices, traces the second half of Hildegard’s long and eventful life. It will be released in early 2019. The Greenest Branch is available on pre-order on Amazon US and Amazon UK and will be released on June 18, 2018. Please check out her website: p.k.adams that includes history, writing and guest blogs, and more information about her and The Greenest Branch. Thank you to Patrycja for this fascinating look into Hildegard of Bingen and for bringing this extraordinary woman to life in The Greenest Branch. I have pre-ordered my copy and I hope you will do the same! I also thank her for hosting me on her blog to promote my latest publications. Please note: I would like to open my blog to more guest posts (at least one per month) by but not limited to authors of quality historical and literary fiction, as well as poetry anthologies. Perhaps you are an avid reader who has a blog, does reviews, or has thoughts on literary or historical persons, periods, or events. Not necessary, but I would appreciate if I could do a guest post on your blog in exchange. I reserve the right to refuse anything I deem not in keeping with the intent, spirit, ethics, and quality of this blog and my own work. If you are interested in guest posting, please contact me. This a revamped post from Easter past with music and words reflecting my three published novels: A House Near Luccoli and its sequel To A Strange Somewhere Fled, and my latest, just released at the end of last year, Without the Veil Between, Anne Brontë: A Fine and Subtle Spirit. Purcell performed the music with his eyes & a delicate finger in the air. And keep thy conscience pure. Or who should scorn or slight. Anne wanted to make the music she loved compactly portable, even without access to a pianoforte, available for performances in her head, preferably so, for then her fingers were agile and her voice wasn’t weak. Four and a half plus years after the publication of A House Near Luccoli, it’s heartening to receive such a beautifully written, in-depth, and engaging review from Margaret Panofsky, author of The Last Shade Tree set to be released this summer. Margaret is also a fine early music performer and dedicated director of The Teares of the Muses, The New York University Collegium Musicum Viol Consort. It is, of course, especially satisfying to receive such a favorable response from someone so knowledgeable and involved with the music and masters of the early Baroque era. I hope this review will spark your interest in reading A House Near Luccoli, if you haven’t already. The novel is available in paperback, Kindle, Audio Book and NOOK Book editions. In “A House Near Luccoli,” DM Denton successfully blends the lives of a fictional female character with an existing historical figure to create a tale that is both believable and moving. The 17th-century Italian composer Alessandro Stradella is well enough known to those of us in the early-music field, although his works are under-appreciated today. However, in the Wikipedia article’s words, “He enjoyed a dazzling career as a freelance composer, writing on commission, and collaborating with distinguished poets, producing over three hundred works in a variety of genres.” When the story begins, Stradella has already committed a serious crime, bedded too many women, fled several cities in disgrace, and survived a near-fatal attack. He has also written quantities of amazing music, much of it sacred. Donatella, the fictional character, is hardly his type. And yet, a most unusual relationship, largely built on mutual respect, slowly evolves. Denton demonstrates the depth of her research and her immersion in the period by depicting in detail a 17th-century household’s furnishings and daily rituals. The thoroughness of the description is especially appropriate since the no-longer-young Donatella is a virtual prisoner inside her own house. We can visualize the furniture, the food consumed, and the scrubbing, dusting, and scouring that go on in the dark, slightly musty and scruffy rooms off the staircase and hallways. We see the practical kitchen, and even a small walled garden, scented by citrus trees. Denton’s subtle rendering of the “pecking order” in a class-conscious society is quite stunning, from the lowest of the servants, to fish sellers, to Donatella herself, to Stradella and the musicians he directs, and upward to the top-tier nobility. Of course, dominating each social class from low to high is the inevitably superior male. The members of these separate classes often rub shoulders, although they usually remain mindful of their pre-ordained positions in life. Now we come to the crux of why Donatella’s character is so interesting, and from the outset, we are spared the typical feminist-heroine of historical fiction, annoyingly spunky and incongruously stuck in a period costume. True to her century, Donatella is not in an upwardly mobile social position, to say the least. She is not particularly beautiful, or, at her age, marriageable. She is not wealthy or a noblewoman. Rather, she is in stasis, genteelly trapped, living under the thumb of an authoritarian aunt while caring for her aged grandmother, her cats, and a scrappy household. When Stradella appears on the scene, she begins to use talents she hardly knew she had, and without guile or flirtatiousness, she fascinates the libertine composer through her goodness and honesty. In spite of his bad-boy reputation, Stradella treats this modest woman, a hidden romantic, with unusual deference. The long sentences made up of multiple clauses separated by many commas bothered me at first, and occasionally I had to reread them to grasp the content. But after a while, I fell under the spell of Denton’s unique style. The overall effect is gauzy, like peering into another era obscured by the haze of centuries. But upon closer examination, I sensed steely precision. These sentences and paragraphs are a paean to Italian baroque architecture—outwardly flamboyant, but powerfully robust, the clauses curling back upon themselves. Her collage-like cover illustrations also embody the delicacy and strength of the novel. This review has been posted on Amazon.com, Goodreads, and Barnesandnoble. Margaret Panofsky has been a director and faculty member for numerous workshops and has played with many other ensembles. She performs frequently with the St. Michael’s Choir. Her New Bass Viol Technique was published in 2012, and an edition of Capricornus’s Ein Lämmlein, co-authored with Kent Underwood, appeared in 2015. Her degrees are from Stanford and the New England Conservatory. She is happy to announce a forthcoming science fantasy novel, The Last Shade Tree, to be published by All Things That Matter Press (lastshadetree.com). and have supported my writing and creative endeavors! A reminder: you can follow Donatella’s journey beyond A House Near Luccoli … To A Strange Somewhere Fled in its sequel, also available in paperback, Kindle, Audio Book and NOOK book editions. And I invite you to add your name to may email list for new of my further publications, like my upcoming Without the Veil Between, Anne Brontë: A Fine and Subtle Spirit, due out later in 2017.